instance, that the Obama administration and its allies are desperate to resume negotiations over Iran's nuclear programs. What better way to set the diplomatic mood than to spit in their eye when, as he sees it, they are already coming to him on bended knee? He also knew that the more outrageous his remarks, the more grateful the West would be for whatever crumbs of reasonableness Iran might scatter on the table. This is what foreign ministers are for. Finally, he knew that the Muslim world would be paying attention to his speech. That's a world in which his view of 9/11 isn't on the fringe but in the mainstream. Crackpots the world over—some of whom are reading this column now—want a voice. 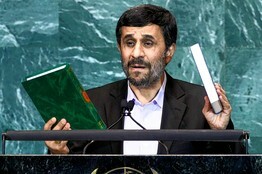 Ahmadinejad's speech was a bid to become theirs. This is the ideological component of Ahmadinejad's grand strategy: To overcome the limitations imposed on Iran by its culture, geography, religion and sect, he seeks to become the champion of radical anti-Americans everywhere. That's why so much of his speech last week was devoted to denouncing capitalism, the hardy perennial of the anti-American playbook. But that playbook needs an update, which is where 9/11 "Truth" fits in. Deeper than the polling data are the circumstances from which they arise. There's always the temptation to argue that the problem is lack of education, which on the margins might be true. But the conspiracy theories cited earlier are retailed throughout the Muslim world by its most literate classes, journalists in particular. Irrationalism is not solely, or even mainly, the province of the illiterate. Nor is it especially persuasive to suggest that the Muslim world needs more abundant proofs of American goodwill: The HAARP fantasy, for example, is being peddled at precisely the moment when Pakistanis are being fed and airlifted to safety by U.S. Marine helicopters operating off the USS Peleliu. What Ahmadinejad knows is that there will always be a political place for what Michel Foucault called "the sovereign enterprise of Unreason." This is an enterprise whose domain encompasses the politics of identity, of religious zeal, of race or class or national resentment, of victimization, of cheek and self-assertion. It is the politics that uses conspiracy theory not just because it sells, which it surely does, or because it manipulates and controls, which it does also, but because it offends. It is politics as a revolt against empiricism, logic, utility, pragmatism. It is the proverbial rage against the machine. Chances are you know people to whom this kind of politics appeals in some way, large or small. They are Ahmadinejad's constituency. They may be irrational; he isn't crazy. 9/11 was an inside job... is that All they have? they blow on about Haarp, the trade in dead iraqis organs??? The remiander will follow the dominant, we need a way of cornering these doninant into silence, making them feel stupid by anticipating their reactions making them feel predictable, nobody likes to be predictable. rhyso on Tue, 09/28/2010 - 4:09pm. "Truther" sounds like "Birther". I am not a "Truther" I am a member of the 9/11 Truth Movement. "Truther" is "their" term, not ours. Jrefers use the slang for "Truther"..."Troofer"....now, do you get the point? John_Parulis on Tue, 09/28/2010 - 4:56pm. but I've found myself using it and I always wince when it comes out. Joe on Tue, 09/28/2010 - 5:11pm. We call ourselves TRUTHERS for a reason. It's quite liberating to embrace the name, wear it proudly. As peacefulwarrior reminded us "We call ourselves Truthers for a reason." Don't let anyone turn this beautiful word into a pejorative. Use it as a turnaround: "Damned straight I'm a truther, and here's what's true ... (insert evidence). To be a 9/11 Truther is to be part of the only relevant political movement around. chriskin on Tue, 09/28/2010 - 5:32pm. Joe on Tue, 09/28/2010 - 5:46pm. They're both good for you. I'm telling you Joe, it's like akido, using the opponent's own momentum against him. The term Truther is not going away; you can cringe at every hearing of it, or you can take it for a spin on the dancefloor. chriskin on Tue, 09/28/2010 - 7:27pm. I don't mind when people use the term "truther" with affection and or respect, but when folks hurl it at me as if it were an insult, I have been known to reply, " yes, I am a truther, why, are you a liar?" That usually shuts them up and if it doesn't WTC 7 or Ali Mohamed will pretty quick. I am of the opinion that "birther" has generated as much ink and derision as it has as one way of trying to slow down the growth of the truth movement by way of muddying the waters and giving those in denial an easy out through reinforcing social stigma. That said, while I would prefer that people understand that I studied international relations and economics in university and bring a very scientific and academic approach to my lifelong study of what we now call "State Crimes Against Democracy" and I prefer to refer to myself as an analyst of deep politics or a conspiracy analyst, I am quite happy to wear the badge of a truther and mix it up with all comers out in the street, peacefully of course. As for the Jrefers, the less said about that pack of juvenile jackals the better. They only discredit themselves with their lame labels and blindingly intellectual dishonesty, so I would not worry about them at all (although opposition research is never a bad thing). Call me a truther or anything you want, just don't call me late for the real investigation (when we finally get it). I want a front row seat! LeftWright on Tue, 09/28/2010 - 7:44pm. This guy is spitting in the wind. The tide is turning. Who would have ever believed that 9-11 truth and the need for a new investigation of 9-11 would be preached from the pulpit of the UN. And the remaining 3/4ths of the world applauded Mr. A. for what he said. The genie is more out of the bottle than ever before, and articles like this that would seek to put it back in are fighting a lost battle. And yes, Mr. Murdoch, who travels in the highest circles of society, may indeed have had an inside line on the events of 9-11 as they unfolded. pduveen on Tue, 09/28/2010 - 8:01pm. I just read your analysis of Ahmadinejad's speech at the UN. How dare you call me a crackpot. Get real. There is a plethora of highly credible, extremely intelligent people who question the veracity of the government's version of 9/11. I appreciate your take on the political spin of Ahmadinejad's remarks, and I might even agree on the political import and motivation behind those remarks. But that doesn't necessarily explain the reasoning behind his conclusions or skepticism, but merely the timing of his disclosure. Might I suggest that you examine and include the opinions of those who have far more credibility than yourself regarding the problems with the official 9/11 narrative the next time you are so inclined to dismiss those of us with genuine concerns about the rationale for endless global war and the US posture toward "terrorism" -- real, imagined or contrived. You might start with someone who's prose once graced the pages of the WSJ. 911Peacenik on Tue, 09/28/2010 - 11:03pm. NOBODY was asking for the TRUTH before the 9/11Truth Movement came into being by ASKING about the most incredible LIES ever perpetrated upon the USofA and the World. Lies which were spun by the most LYING, DECEITFUL, CRIMINAL, MANIPULATIVE and CONTROLLING Administration that has ever occupied the White House. Remember the "Stenographers for the White House?" Now, there are so many elements within our society that are demanding truthful answers that its amazing. CREDS to Mike Malloy: Mike has been using "Truthseekers" on his radio broadcasts for years and certainly set the stage for what's happening right now...but not as a movement. So, when someone else tries to take the credit for being the first "truthers"...NYET...its was the early and succeeding 9/11 Truthers who will forever hold that distinction...and THAT'S THE TRUTH! Other than fathering and raising my kids, being a TRUTHER is the proudest accomplishment in my entire life. I'm a TRUTHER and I'm stickin with it! And when I die, the daisies that I push up will spell the words TRUTH SEEKER on their petals. Robin Hordon on Wed, 09/29/2010 - 9:57am. even i didn't know about the organ sales. I thought only china did that, I guess you can lean something new everyday. Wow only 2% of Pakistani's believe Osama did 911, now how would they know that? They must be well informed and close to the source I would say. Sounds like that country is wide awake eh? Must be you have to get up early in the morning to avoid those drone attacks. Hey don't forget to say hello to boys down at the agency for us. peacefulwarrior on Wed, 09/29/2010 - 3:07pm.